I like Lee’s depiction because it shows all of the behind-the-scenes work that goes into the Thanksgiving feast. 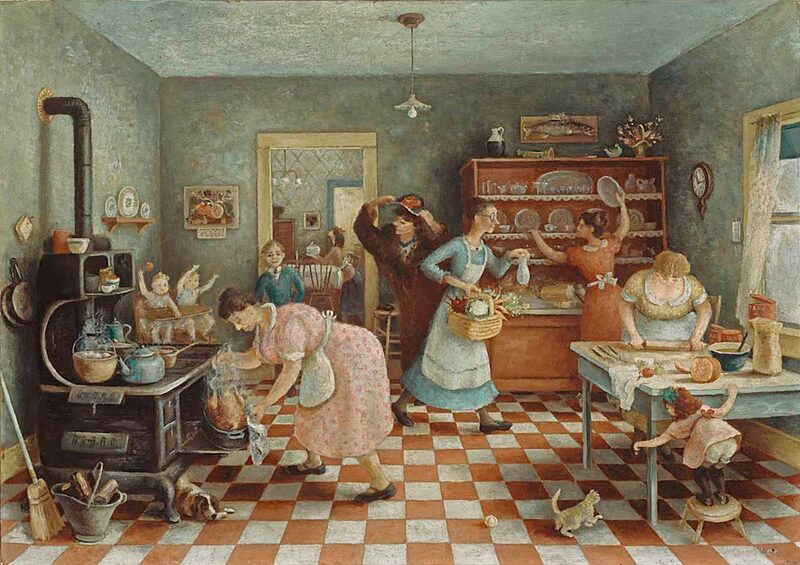 Perhaps I’m drawn to this painting because I’m cooking the turkey for the first time this year. (Gasp!) Nochlin pointed out that the food appears to miraculously appear on Rockwell’s table, whereas Lee stresses the preparation that goes into a Thanksgiving meal. Nochlin also pointed out that all of the people in the painting are women, except for one lazy boy who stands aloof and watches everyone else work! Although I think that these two paintings are dissimilar in style and subject matter, I do think that they both capture the excitement and sense of anticipation that is part of Thanksgiving. The bustling movement and energy of Lee’s women is related to the energetic interactions between the people at Rockwell’s table. And the man in Rockwell’s foreground invites us to join in the fun, gazing outward with his twinkling eyes and excited expression. I think it is this sense of excitement that I like best about these paintings, and it’s one of the things that I love about the Thanksgiving holiday. 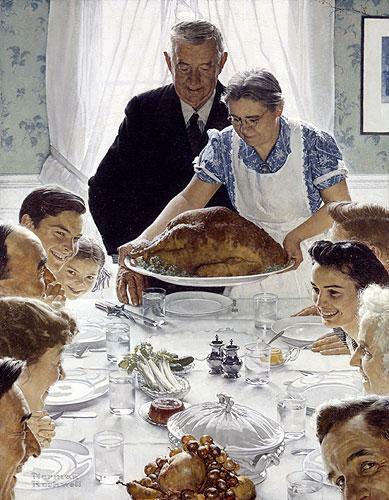 Do you know of other depictions of Thanksgiving? What’s your favorite part about the Thanksgiving holiday? There were two things in Nochlin’s lecture that I thought were especially interesting. I liked how Nochlin compared Mary Cassatt to the compositional devices in Little Girl in a Blue Armchair (c. 1878, shown above on right). Nochlin pointed out that Cassatt was extremely aware of childhood and its discontents, as is evidenced in the painting and subject matter. The little girl is slumped in her chair – it’s obvious that she is annoyed with the convention of portraiture and having to sit still (for a long time!) while her portrait is painted. The girl’s resistant attitude is emphasized by her angular body within the composition: there’s an interesting contrast between the angular body of the girl and the soft, circular body of the dog. Nochlin paralleled this painting to the discontent that Cassatt felt in her own life. 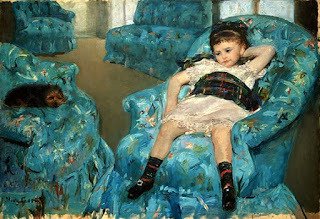 Like this little girl, Cassatt was also resistant to convention and tradition. As a suffragist and avant-garde artist, Cassatt defied the standards that were upheld by 19th century society. Cassatt’s disregard for the tradition of painting is even emphasized in the unconventional perspective of Little Girl in a Blue Armchair; the viewpoint has been lowered so that the scene is viewed from the perspective of a child, not that of an adult. Nochlin also made a passing comment that I thought was interesting. She was discussing Dorothea Lange’s Migrant Mother (1936, shown on right) and mentioned that she liked that the photograph was black and white. Nochlin feels like there is a true feeling of “documentation” when a photograph is black and white – there is a refusal of the decorative, emotional quality that comes with color. In terms of facts and documentation, the idea of “black and white” is extended to the newspaper and media paradigm, since people say “I read it in black and white.” Interesting, huh? Did anyone else have a chance to hear Nochlin’s lecture? What do you think of the two ideas I mentioned? I got distracted today by Dürer’s Adam and Eve (1504). 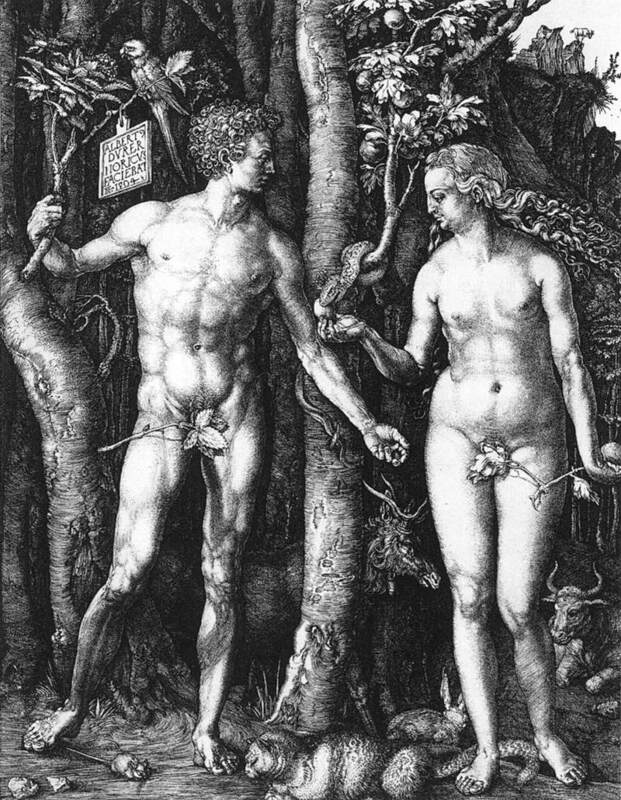 I’m preparing a lecture on how Dürer’s engraving Melencolia I is influenced by the doctrine of the four humours, and then I remembered how Dürer also included references to the four humors in his Adam and Eve. Let me explain a little bit about the doctrine of the humours. It a very complex notion about how humankind was linked to the natural world. The doctrine of the humours has largely been disproved by modern medicine, but it’s interesting to think about, especially since the doctrine was upheld for thousands of years. One interesting aspect of the doctrine discusses how basic elements of the earth are transformed into food for humans. Depending on the nature of the element, the food will then create four different bodily fluids (that in turn create different character types). Are you following me? The four character types or temperaments are: the melancholic, the phelgmatic, the choleric, and the sanguine. It’s interesting to see how these animals are still kind-of associated with these character types today. Doesn’t the phrase “Breed like rabbits!” still tie into sensuality? And aren’t oxen typically associated with slow, sluggish movements? Are there any symbols or animals that you particularly like in this engraving? I’m always intrigued by the ibex in the far background (standing on the top of a mountain). I like the interpretation that the ibex is a represention the Adam and Eve, who figuratively stand on a spiritual precipice because of the Fall. 1 Erwin Panofsky, The Life and Art of Albrecht Dürer, Princeton University Press (1955), p. 120 and pp. 84-84. Citation also available online at http://www.csus.edu/indiv/v/vonmeierk/4-05BEAU.html, accessed 17 November 2009. If you’re interested in reading more about the iconography/symbolism for the other animals and objects in this engraving, I’d recommend that you read Panofsky’s interpretation. I’m still thinking about Watteau this week. On the left is a portrait of Watteau by Rosalba Carriera (1721). Does this change my belief that Watteau was influenced by the Flemish master Rubens? Of course not! There’s no doubt that Watteau was interested in the Flemish masters, and I’m quite sure that Valenciennes maintained many Flemish customs and traditions, even after the French gained control. I guess it’s possible that Watteau considered himself to be Flemish, since his father was of Flemish descent. Watteau’s interest in Flemish art suggests that the artist was interested in his heritage, to say the least. But if one wants to get technical, I think it would be most correct to say that Watteau had Flemish ancestry, but he was born on newly-acquired French soil. In my mind, that means Watteau was French. 1 Emma Barker, Nick Webb, and Kim Woods, eds., The Changing Status of the Artist (London: Yale University Press, 1999), 233. 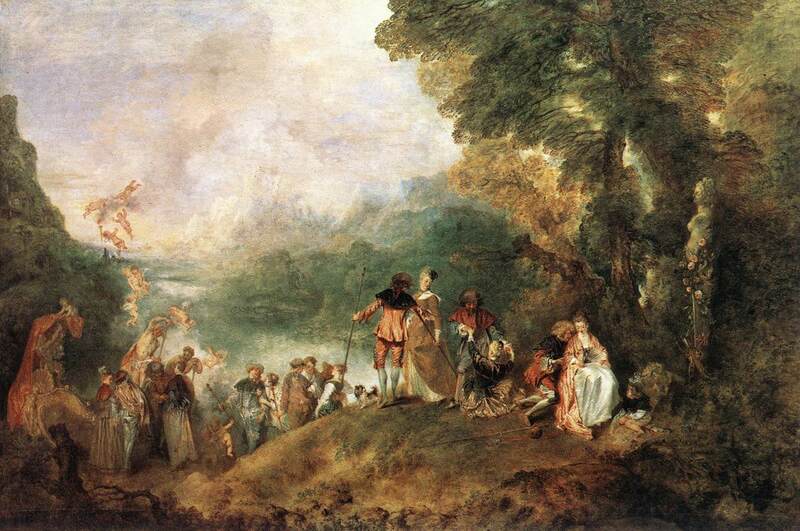 In my earliest art history classes, I remember learning that Watteau was associated with the “fête galante” genre from the Rococo period. The “fête galante” includes depictions of feasts or celebrations of gallantry, and it usually showed idle aristocrats in outdoor settings. It’s interesting to see that several demeaning or derogatory terms have been associated with art initially, and then the term ends up sticking to the art/artist in a positive way. The Fauvists received their name after an art critic compared the group’s paintings to “fauves” or wild beasts. Likewise, the term “impressionists” was coined by the art critic Louis Leroy as a demeaning way to mock the art of Claude Monet (and others that exhibited in the Salon des Refuses in 1874). Can you think of any other instances when a demeaning term has become a badge of honor for an artist or movement? 1 Emma Barker, Nick Webb, and Kim Woods, eds., The Changing Status of the Artist (London: Yale University Press, 1999), 229.